How long should I wait before bringing my horse back to a normal work schedule after laminitis? Many horses recover to soundness after a bout of laminitis, but there are a lot of factors that go into how quickly and fully an individual will recover. Q: My horse foundered a little over a month ago. How long does it take for a horse to fully recover from founder? He can now execute all gaits properly, but I was wondering if there are any precautions I need to take when working him. A: It often seems like there are no black and white answers when it comes to founder or laminitis and this question is no exception. So often, the outcome of founder is directly related to the amount of damage done to the sensitive laminae, the delicate Velcro-like structures inside the hoof capsule that hold the coffin bone suspended in place. If there has been severe rotation of the coffin bone due to the destruction of the laminae, some horses never fully recover. On the other hand, there are many cases where there is no rotation, or at least minimal change to the coffin bone, as seen radiographically. If this is the case, then the horse can have a full recovery perhaps in as little as six to eight weeks. It can be assumed from your question, since your horse seems to be sound at all gaits without a rider, that there was minimal or no rotation/sinking of the coffin bone during his bout with founder and the following answer will be based on this assumption. I will also assume your horse is off all pain medication, such as phenylbutazone (bute). If this is not the case, do not start any ridden work until he is sound without the help of medication. Before starting your horse back to work in earnest, it would be a prudent idea to put hoof testers, those metal pincer-like tools that your vet and farrier sometimes use to test for pain within the hoof capsule, on your horse’s founder-affected hooves. 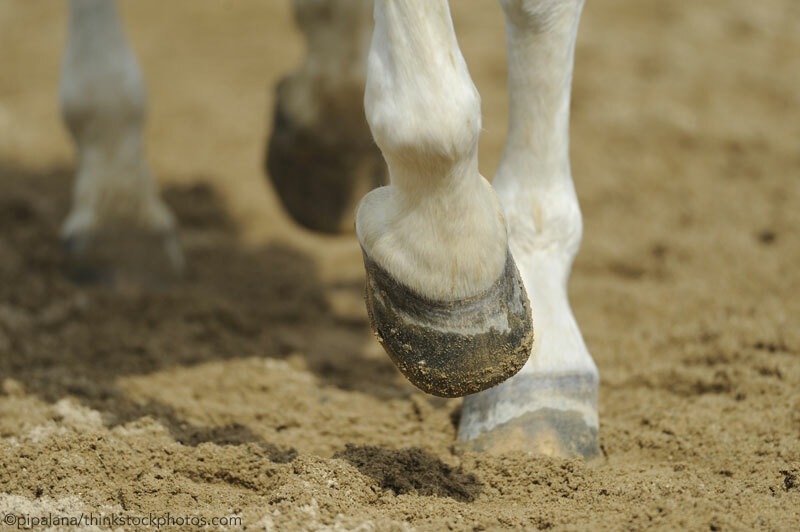 If your horse does not respond with a flinch as you put pressure around the sole, this is a good sign that there is no longer any pain within the hoof and you are good to go to start working him again in saddle. It may also be a good idea to have your farrier out for a visit before you start riding again. Founder can disrupt the growth of the hoof wall (some horse owners may be familiar with the wavy lines seen in badly foundered hoof walls – these are often called founder lines) and if there are any hoof balance issues that have developed since your horse’s bout, your farrier may be able to detect this. As with any return to work after a lameness or other illness, start your horse back slowly and on soft footing. If you have access to an arena or ring with soft, loose footing, this is the best place to begin bringing your horse back into work. For the first few sessions, keep them short and work only at the walk. If your horse tolerates these sessions without any problems both during and after the workout, then slowly and gradually increase the time spent on his back as well as the speeds at which you are working him. Pay special attention to how he moves AFTER you work him, to pick up any residual pain, paying keen attention to how he handles himself on turns, as subtle lamenesses will often show up in this maneuver first. A few weeks of slowly bringing your horse back under saddle should provide enough time to evaluate his progress and his comfort. If all goes well, you should be well on your way to bringing him back to where he was before the laminitis. Good luck! Anna O'Brien, DVM, is a large-animal ambulatory veterinarian in central Maryland. Her practice tackles anything equine in nature, from Miniature Horses to zebras at the local zoo, with a few cows, goats, sheep, pigs, llamas, and alpacas thrown in for good measure. This is very useful information. I brought a pony, who “must” foundered in the past, but it was not mentioned to me. It is a very painful to the owner and the horse/pony. Alway good imformation….specially to know how to prevent it in the first place. I have a 14 year old quarter horse that has been diagnosed with founder I have been treating him with cold water soaks and butte since september 1 and there seems little improvement I also walk him every day he walks very stiff legged. What else can I do ?